Airport runways were closed Tuesday to allow a deer hunt to take place. 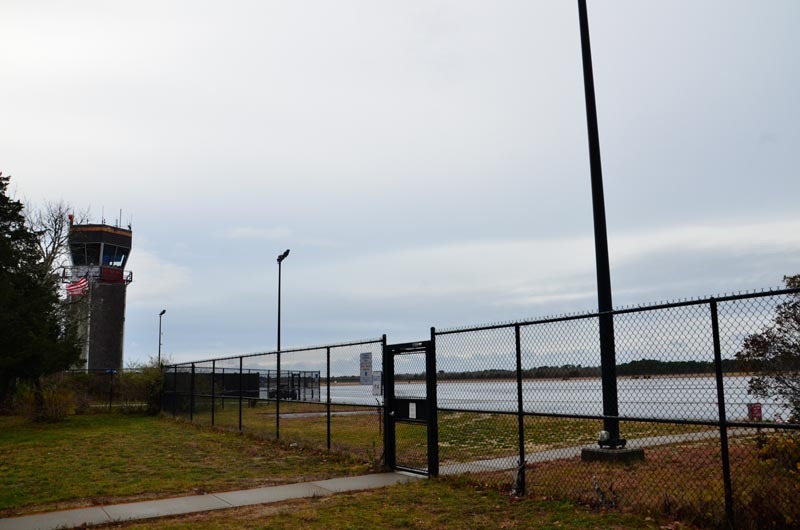 A one-day hunt inside the perimeters of the Martha’s Vineyard Airport this week netted two deer, but more remain, acting airport manager Deborah Potter said. “We would have preferred a higher tally,” Mrs. Potter said in an email to the Gazette Wednesday, one day after the controlled hunt. “A very rough estimate based on the reports I have received indicate that there may still be approximately four to five deer left that we will still be working on removing from the premises,” she said. The airport was closed to flights from 10 a.m. to 4 p.m. Tuesday to allow the hunt to take place. Mrs. Potter said it is unclear how the deer established themselves inside the airport perimeter fence. “I am not aware of any specific breaks in the fence over time so I would have to surmise that they either jumped the fence or are descendants of the few deer that remained after similar depredation occurred years ago,” she said. There was only scant public notice about the airport closure and hunt. A standard Notice to Airmen (NOTAM) was filed with the FAA and displayed in brief abbreviations on the FAA website. There was no information on the airport website, and no information posted in the airport terminal. Airport staff, hangar owners and tenants, and airport commissioners were notified of the closure in an e-mail from Mrs. Potter on Dec. 1. Aviation safety hazards from wildlife, including deer inside the airport perimeter, have been a point of contention with the Federal Aviation Administration following a series of inspections this spring and summer. The FAA gave airport management until Oct. 15 to submit a wildlife mitigation plan to correct the problem. Mrs. Potter declined to provide the Gazette with a copy of the mitigation plan, because it has yet to be approved by the FAA. According to airport officials, there was another hunt about two weeks ago during archery season, but they had no information about how many deer were taken. The Massachusetts Division of Fisheries and Wildlife issued a special permit on Oct. 30 that allows the airport to arranged controlled hunts of many different birds and animals, including deer. There are a number of conditions. The permit holder is required to keep records of all wildlife taken under the permit, and provide a written report to the Division of Fisheries and Wildlife by Jan. 31, 2016. The permit encourages wildlife mitigation during hunting seasons. Airport commission chairman Myron Garfinkle said managers coordinated the hunt with airport users to minimize disruption. One of those inconvenienced was Mr. Garfinkle, who flew off-Island before the airport closed Tuesday. Late in the afternoon he was still on the mainland. “I’m waiting here for the NOTAM to expire, so I can fly back home,” he said. Why would it be of any interest to the general public? Or any of their business for that matter? All users of the airport were properly notified well in advance. Don't try to make an issue where there isn't one. I think the answer to your questions is pretty simple: They are a government agency, acting for the good of the general public. How they conduct their business, in the interest of the general public, is everybody's business. It IS very simple. If you are not a pilot using the airport, it is of no consequence to you or anyone else in the 'general public' if the runways are closed or open. Do you express your concern when the runways are closed for snow removal or restriping? NOTAMS (notices to airmen ) are published by the FAA for USERS of the airport. The airport is a government run facility that many of us depend on. I travel frequently out of that airport for business and would like to know when it isn't going to be available. A notice should have been publicly posted in advance that the airport was going to be closed. It was properly posted as NOTED above. In addition to the NOTAM being posted, an email was sent to users of the airport well in advance. Its apparent you are not a pilot so you would not be receiving that email or reading the NOTAMS as published by the FAA. One would expect that if you planned to travel out of that airport, you would either charter an aircraft or purchase a seat on a scheduled carrier. And those entities were well aware of this in advance. So unless your business travel entails walking up to the counter without making a reservation in advance, hoping to get an empty seat, or picking up the phone and expecting an immediate response for a chartered plane,your comment is unwarranted. I received advance notice of the airport closure and planned accordingly. The airport managers should have the ability to conduct operations that will effect safety at their discretion. Years ago we had a large PBA commercial prop flight trike a deer at MVY. It was a bloody mess and the aircraft was disabled at a significant cost and delay. A c402 would likely have ended in a crash landing in that incident. Let people do their job and make the place safer. I used to fly pressurized turboprops for ASA into Charleston West Virginia where we had one crew strike two deer standing on the centerline of the runway; one was struck by the no. 2 engine, and broke off 1/2 of the prop which lodged into the right femur of the passenger sitting in seat 3A. She was promptly taken to the hospital, released after a few days, but then developed a massive infection, returned to same hospital and died ~32 days later. Last I had heard the deceased had attempted to sue the airport authority for failing to provide adequate safety. Glad to see you are doing something about it. More grasslands outside the perimeter fence would help dissuade them perhaps..